Hawaii, America's paradise, attracts over 6.4 million visitors each year, drawn to the state's gentle island breezes, historic culture, and beautiful beaches. 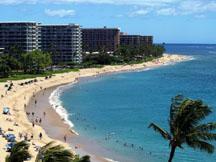 City lovers will enjoy Honolulu on the island of Oahu and all of its shopping, fine restaurants, and nightlife. Beach lovers will want to venture out to the quieter islands, such as Kauai and Maui. The Big Island of Hawaii offered a little bit of everything, from the spectacular Volcanoes National Park to the magnificent black lava beaches. You can even snow ski on Hawaii. Paris, the "City of Lights," belongs on any list of top travel destinations. The French capital offers an array of attractions for visitors - from high fashion shopping to striking architecture to centuries of history. Paris is also home to some of the world's most important museums, including the Louvre and the 19th century art museum, the Musee d'Orsay. Just outside of town is the sumptious Palace of Versailles, the former home of Louis XIV and other French kings. Visitors to Paris during the spring, summer, and fall will enjoy the many spacious parks and green spaces, ideal spots for sharing a loaf of bread, a bottle of wine, and some cheese. Florida's attraction of over 1200 miles of coastline are a magnet for vacationers seeking the ocean, making it one of the United State's top travel destinations. From Miami to Panama City, from Daytona Beach to Key West, the state offers brilliant white sand beaches, plentiful fresh seafood restaurants, and warm sunny weather. For families, Florida is home to the many amusement parks of Walt Disney World as well as Cypress Gardens, Busch Gardens in Tampa, and Universal Studios. Those seeking a stylish vacation with lots of nightlife will be right at home in Miami's South Beach neighborhood. Vacationers wishing a quieter, more tranquil beach vacation should try west coast resorts, such as Sanibel Island and Naples. Mexico is affordable, friendly, sunny, and fun. This diverse country, just a short plane ride away from most North American cities, offers bustling beach resorts, such as Cancun and Acapulco, as well as quiet seaside resorts, such as Puerto Vallarta and Cabo San Lucas. Visitors to Mexico can explore the country's Mayan heritage at the ruins throughout the Yucatan Peninsula; savor the savory and spicy cuisine, and shop for bargains on textiles, silver, carved wooden items, and colorful arts and crafts. The "Big Apple" offers something for any and every visitor. Whatever your interests, from art to shopping, from concerts to quiet walks in the park, New York City has it. Enjoy a day of art at the Metropolitan Museum of Art, take in a Broadway show, or shop at some of the world's most exclusive stores. History buffs will enjoy South Street Seaport, a living museum that shows how New Yorkers lived in the early 18th century. And, of course, there's always the Empire State Building and the Statue of Liberty.